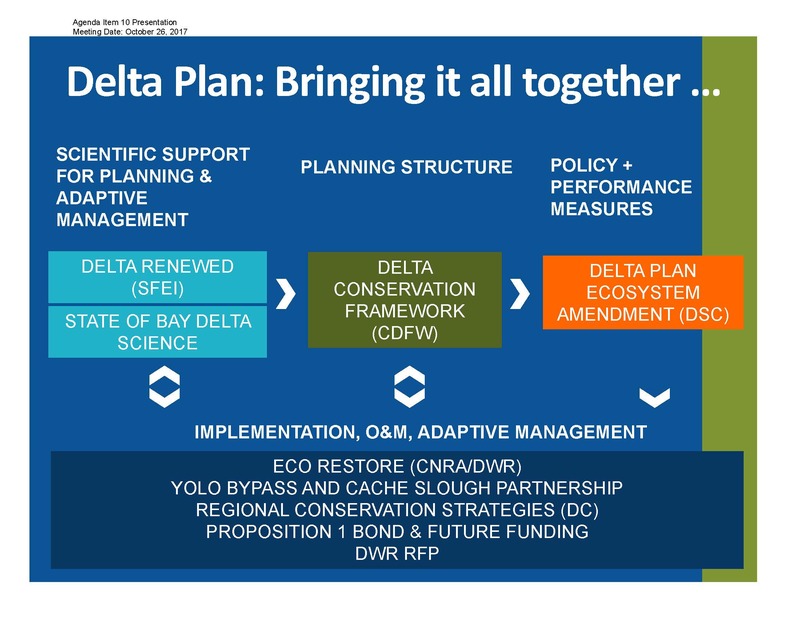 At the time the Delta Plan was adopted in 2013, the state was pursuing a comprehensive approach to infrastructure and habitat restoration through the Bay Delta Conservation Planning (BDCP) process. 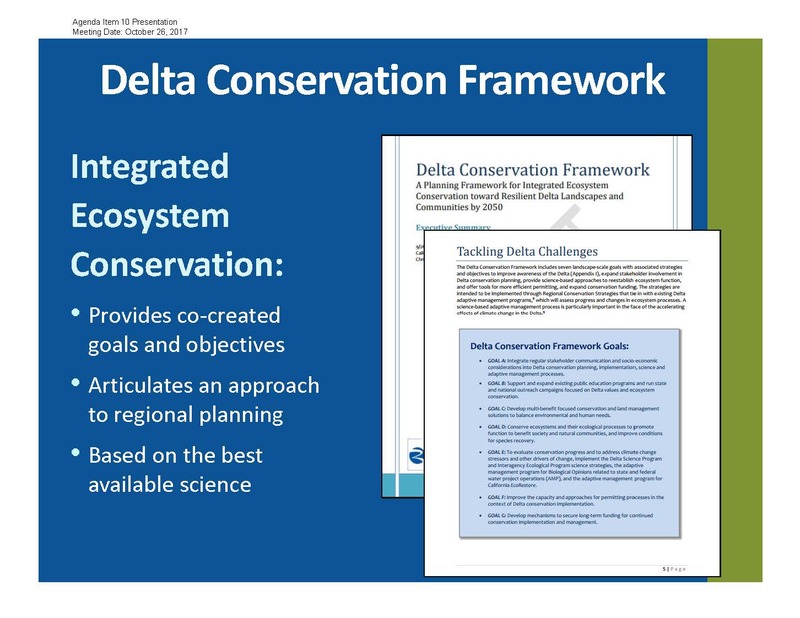 The Delta Plan, as written at the time, anticipated that many of the conservation measures that were contained in the BDCP would contribute to the success of ecosystem restoration. In 2015, the state changed the course of their planning process by bifurcating the project into the California Water Fix for the infrastructure portion, and EcoRestore to address ecosystem restoration in the Delta. 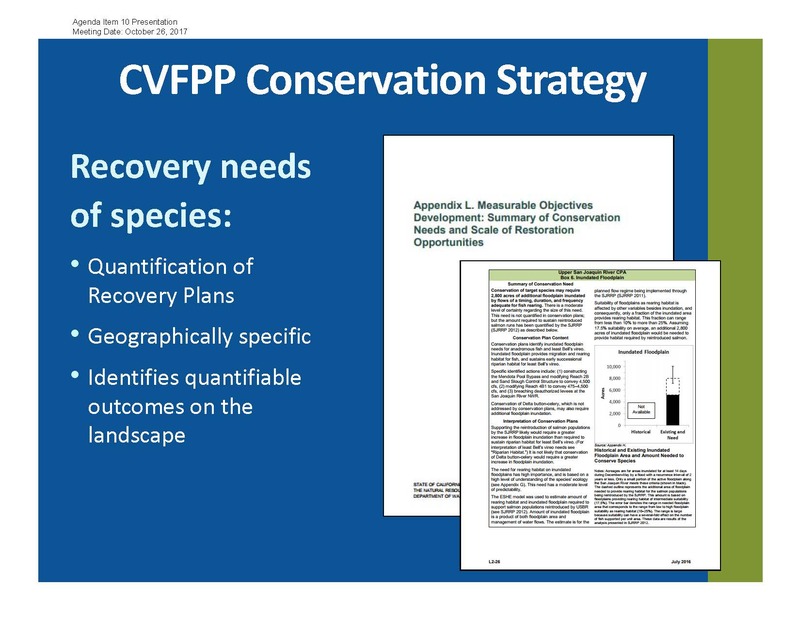 The split of the more comprehensive BDCP into two smaller programs has left out some of the planned conservation measures that were intended to address specific Delta stressors. 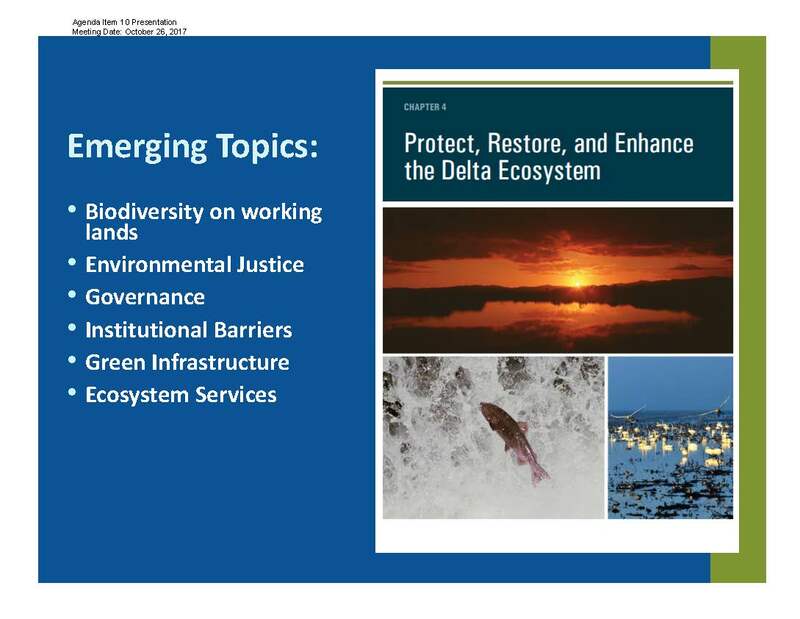 Also, since 2013, there have been significant milestones reached and lessons learned in planning, restoration, and monitoring which provide further insights into the opportunities and challenges for ecosystem restoration in the Delta. 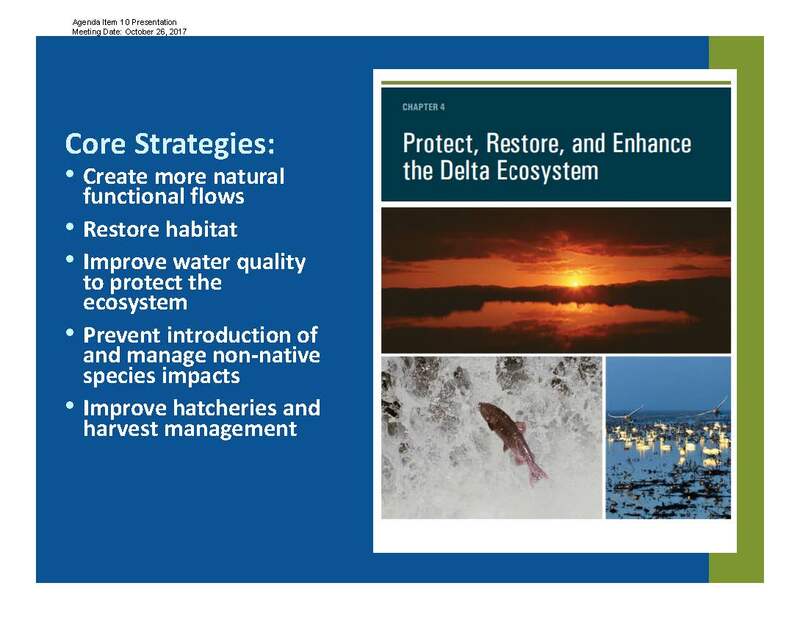 Currently, the Delta Plan, and specifically Chapter 4, includes regulations covering flow, introduction of nonnative invasive species, and criteria for priority restoration sites. 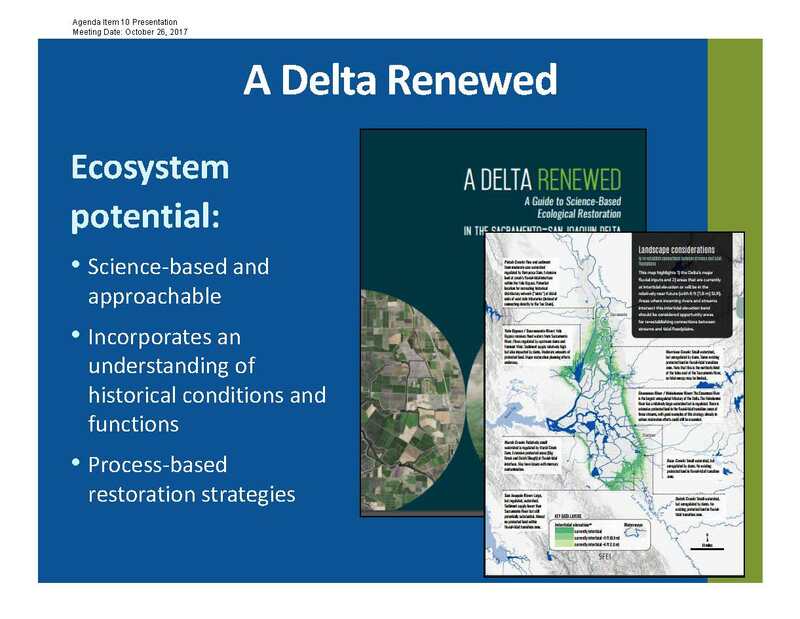 Through a public process beginning now and lasting through 2018, the Council will work with partner agencies, stakeholders, and the public to build upon, further refine, and amend Chapter 4 of the Delta Plan. Through this amendment, the Council will review and update, as appropriate, the proposed actions, policies, recommendations, and performance measures in Chapter 4. 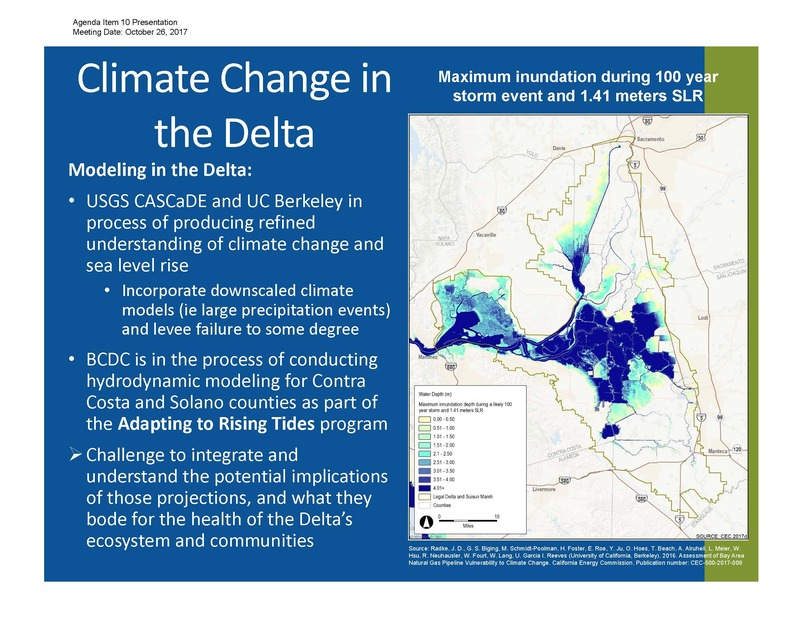 Staff intends that this ecosystem amendment will consider the past and future effects of climate change and sea level rise, incorporate lessons learned about adaptive management of the Delta ecosystem, identify best practices, address needed institutional changes to improve implementation of restoration actions, and be informed by the best available interdisciplinary science. At the October meeting of the Ron Melcer, Senior Environmental Scientist Supervisor, gave a presentation to the Council on the upcoming process, discussing through the rationale, the scope, the schedule, and planned outreach. This new information makes them better positioned to think about natural resource management in the Delta, so they will be working to synthesize all of that in the development of the amendment, he said. Mr. Melcer noted that there are many parts to consider for the amendment: the narrative, the proposed actions, policies and recommendations, and performance measure refinement. They are in the process of taking a deep dive into the chapter and marking up where things may need to be updated. Councilmember Ken Weinberg said he doesn’t have a clear sense of what the amendment is supposed to accomplish. 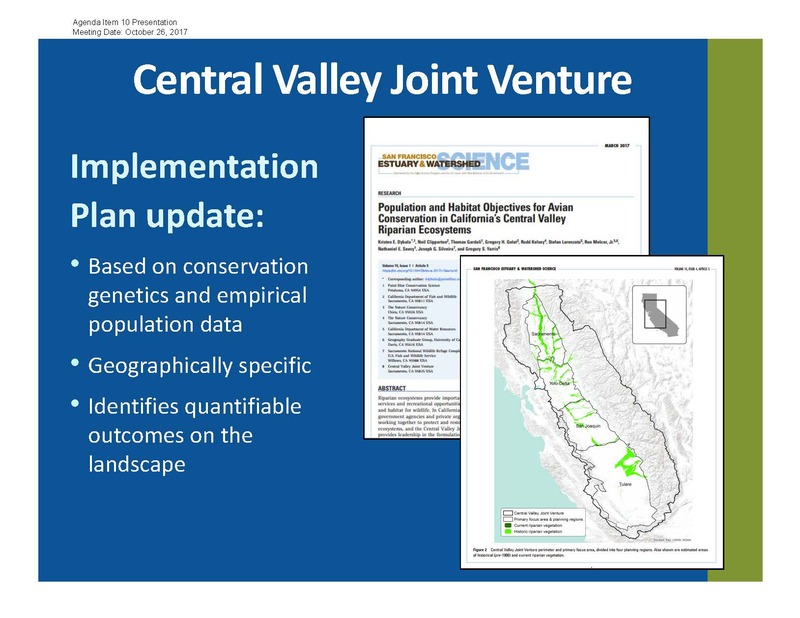 Chair Randy Fiorini explains that when the BDCP chose to split into Cal Water Fix and EcoRestore, there were 21 conservation measures identified to improve the ecosystem. Cal Water Fix and Eco Restore cover some of those, but not all of them; those are referred to as ‘orphaned conservation measures’. One of the goals is to adopt those. Chair Fiorini also acknowledged the new reports that have been issued in the past few years and notes that he wants the amendment to build on the work that has been done. Mr. Melcer notes that the new information can give them an updated, more refined look at those concepts on the landscape and assures the Council that they will be including synthesis of those works. Executive Officer Jessica Pearson noted that Chapter 4 of the Delta Plan is a good chapter, a lot has been learned since 2013 and there are improvements to be made. They hope to integrate the new material and weave that in as much as possible and work smarter, not harder, she said. She noted that the ISB has advised they prepare a white paper that discusses the drivers for the amendment and summarizes the science and what’s been learned since 2013. Mr. Melcer said that they need to spend some time considering sea level rise and climate change, and the implications for our priority habitat restoration areas for the policies related to restoration and elevation. 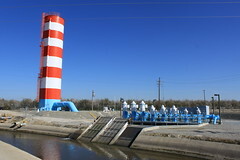 The new amendment will focus on adaptive management and the lessons learned, such as those lessons learned from the covered actions process, at the program level with the development of an adaptive management framework as part of EcoRestore, and at the system level with the development of the Science Action Agenda. Other emerging topics include biodiversity on working lands, environmental justice, issues of governance, institutional barriers such as permitting and challenges with long-term management, green infrastructure, and ecosystem services. Currently, they have been heavily engaged in outreach; the Council Chair and Vice Chair have been conducting listening sessions with important high-level stakeholders and partner agencies, and staff has been coordinating and doing outreach with partners, stakeholders, state, federal, and local agencies. They will be working through a Delta Plan Interagency Implementation Committee working group to gather input as well. There will be public meetings as well as the CEQA process, which will add an additional layer of outreach and review. Over the next six months, they will be working to synthesize the new bodies of work and distilling the research and synthesis into either a white paper or some focused topic papers that will discuss specific topics, uncertainties, and policy recommendations. As for the timeline for development of the amendment, staff will be working on the draft amendment through March; this will include looking at the chapter and the technical bodies of work, and producing the white paper and other technical analyses that underpin that exercise. In January, they hope to present draft performance measures to the council as an information item, and start the discussion about the metrics for understanding the policies and recommendations are achieving the intended outcomes. During the winter and spring of 2018, the Council will review and provide input on proposed policies and recommendations. They hope to file a notice of preparation to initiate CEQA sometime in the spring of 2018 with a draft CEQA document in the summer of 2018. The target date is to deliver a CEQA document and a proposed amendment for Council certification and adoption in December of 2018. 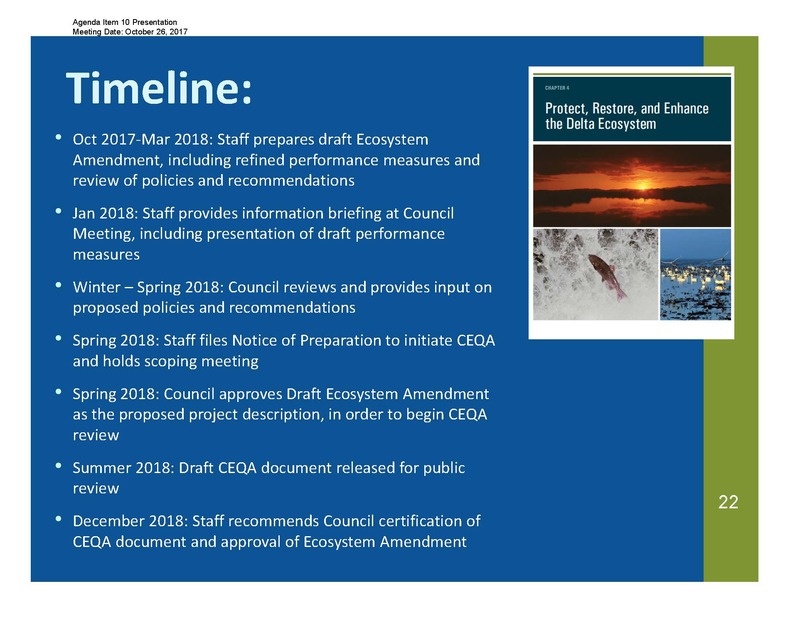 Click here for the Staff Report: Approach and Timeline for Delta Plan Ecosystem Amendment. Click here for the Ecosystem Amendment Fact Sheet. Click here for the agenda and meeting materials for the October meeting of the Delta Stewardship Council.